We provide modern facilities such as Netflix wifi, hot showers with good pressure, an open bar; a library with travel guides and large music catalog; the gym, laundry with express washing machine; and a fully stocked kitchen for those who like to fix their own meals. Our staff is knowledgeable and passionate. We are always eager to advise the best country tours, city events and cool places to hang out. Our reception desk is open 24/7. Our breakfast is freshly made, abundant and delicious. No dry toast and margarine here: You’ll feast on frosty morning cappuccino, vegetable soup, smoothies, healthy bread, great cheese, fresh fruits, pancakes, eggs, chocolate cakes and chapattis. We welcome our guests to our monthly "Umuganda" community works which is an opportunity to volunteer in cleaning or building bridges or homes in our village. We also run films and documentaries which provide insights into African and global history, culture and politics. It is an opportunity for guests and hosts to share their perspectives. The bus and moto/boda station is only a 2 minutes walk. You can walk to Juru Park for sunny day. If your interest is swimming, tennis etc, there is a large sports club nearby called Cercle sportif. This is a really lovely hostel. The best breakfast I've ever had at any hostel in 45+ countries, an amazing view of the city, and a great place to get some work done or meet people. Also, they rent out luxurious large and fluffy towels. I had an amazing stay at Yambi! The staff is very helpful in coordinating transportation for you in Kigali as well as around Rwanda. The food is spectacular!! I will definitely stay here again and highly recommend it! 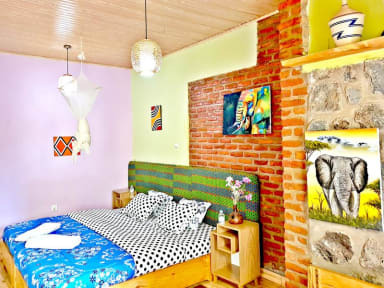 My wife and I highly recommend the Yambi hostel in Kigali. They were extremely kind and helpful. Everything about the place was great. The staff were fantastic. It was a complete joy to stay at Yambi hostel. 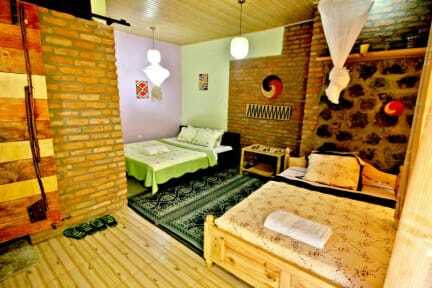 This is a truly wonderful place to stay, in a lovely neighborhood at the edge of Kigali with a fantastic view. I especially would recommend it for groups. Patrick, the young, dynamic, cosmopolitan owner is fantastic; Emanuel and the front desk staff are very helpful and responsive hosts; and chef Alfonse and his team are wonderful. I came here as a professor with a small group of American students in tow, and this turned out to be a great home-away-from-home for us. Outstanding. Absolutely loved it . A bit far from town, but as far as safety, kindness of staff, and stellar accommodations, this is the absolute best place to stay in Kigali. Great place to stay, highly recommended. Homemade food is fantastic if you have a long day and don't want to go out for dinner. Ideal. I had originally intended to stay just two days at Yambi, but ended up really enjoying being there and extended my stay to 6 days. The location is a little far from the city centre (20-30 mins) but if you're somebody who doesn't mind taking the motobike taxis (£1) then it really isn't much of an issue. The local area is friendly and safe and provides a nice view of the city, especially at night. The Yambi Staff are lovely and will make you feel very welcome and their breakfast is top class! Beautiful hotel and rooms with views of the city. Very relaxing, peaceful atmosphere and the staff were incredibly helpful. Really nice hotel, really nice staff, amazing breakfast. Only downside is the location. It's not near anything (including restaurants), so you'll need to take a moto or taxi to get anywhere.